The landscape of outdoor advertising is rapidly changing thanks to the growing popularity of digital signage. Display providers and marketers agree: the combination of cinemagraphs and out-of-home displays makes for a powerful advertising experience. There’s an old proverb that goes, “familiarity breeds contempt.” However, with regard to marketing it might be more appropriate to say, “familiarity breeds disinterest.” Examples of this adage abound in everyday life: If we eat the same meal for breakfast every day, we soon become disinterested in it. If we listen to the same music every day, we soon become disinterested in it. Apropos advertising: If we see the same advertisements every day, we soon become disinterested in them. This is especially true of outdoor advertising. Most of us are so inundated by billboards, posters, and other displays that we simply ignore them. They are so ubiquitous, indistinguishable that they fade into their surroundings—unless they’re digital. Cinemagraph in digital display by Aaron Coury. Digital out-of-home (DOOH) advertising is rapidly becoming the go-to format for advertisers and their clients alike. And it’s not hard to see why. DOOH offers a welcome alternative to traditional print formats. High-resolution images and videos are not only more enticing, they are also more versatile. DOOH only requires an internet-connected digital device. These can easily be placed in a number of locations such as: shopping malls, grocery stores, gas stations, taxis, busses, subways, restaurants, and so forth. The reach of this format offers incomparable marketing leverage, and advertising firms worldwide—particularly in the US and Europe—have been steadily increasing their spending on DOOH. By 2019, digital is slated to account for 57.5% of OOH in the US; in the UK it will account for 43% by the end of 2017. In Germany, outdoor advertising firm Ströer plans to install 1,000 new digital surfaces by 2020. Make no mistake, DOOH is on the rise. Left: Note: includes out-of-home advertising (alternative, billboards, cinema, street furniture & transit) that is internet-connected, Source: eMarketer, Oct 2015; Right: Source: GroupM, “This Year, Next Year: UK Media and Marketing Forecasts,” Nov, 2016. For marketers, the conversion en masse to digital begs one question: How do we differentiate ourselves from our competitors? The answer is cinemagraphs. An alluring combination of static and motion elements, cinemagraphs possess an unparalleled ability to arrest the attention of anyone within eyeshot. Already proven to be a highly-effective digital marketing tool for e-mail campaigns, websites, and social media, this burgeoning medium is also beginning to take DOOH by storm. Major brands like Siemens have already started to incorporate cinemagraphs into their DOOH campaigns. However, the trend is still quite young, and, therefore, mostly foreign to the average consumer. This is nothing but advantageous to those who wish to make a unique, lasting advertising impression. Browse our collection of stock cinemagraphs. I remember the first time I encountered digital signage at a subway station in Chicago. Amid a sea of advertisements, this particular format actually caught my attention. It was crisp, vivid, and enticing. It was totally unique. I had the very same reaction the first time I saw a cinemagraph. The image was of a thick stream of molten chocolate, dripping down onto a fresh pastry. It was mesmerizing, like nothing I’d ever seen before. Both of these mediums are captivating, especially to first-time audiences. Therefore, the time to capitalize on the advent of cinemagraphs in digital advertising is now. To get a little more insight on the rise of cinemagraphs in DOOH, I reached out to gallereplay artist Virgo Haan. Recently, Haan has been collaborating with JCDecaux in Estonia to create cinemagraphs for their digital displays in the capital of Tallinn. Constrained by a city ordinance that forbids video ads on outdoor signage, the company found a loophole in the form of cinemagraphs, and asked Haan to create some for them. What was at first a compromise turned out to be a blessing. According to Haan, JCDecaux conducted a study in which they compared videos adapted from TV commercials with cinemagraphs. They found that cinemagraphs were actually far more effective for the following reason: when people watch outdoor video ads, they have an attention span of three to five seconds. It’s difficult to succinctly showcase both a product and a call-to-action in that short amount of time. With cinemagraphs, however, it’s possible because of the ever-present way in which they loop information. 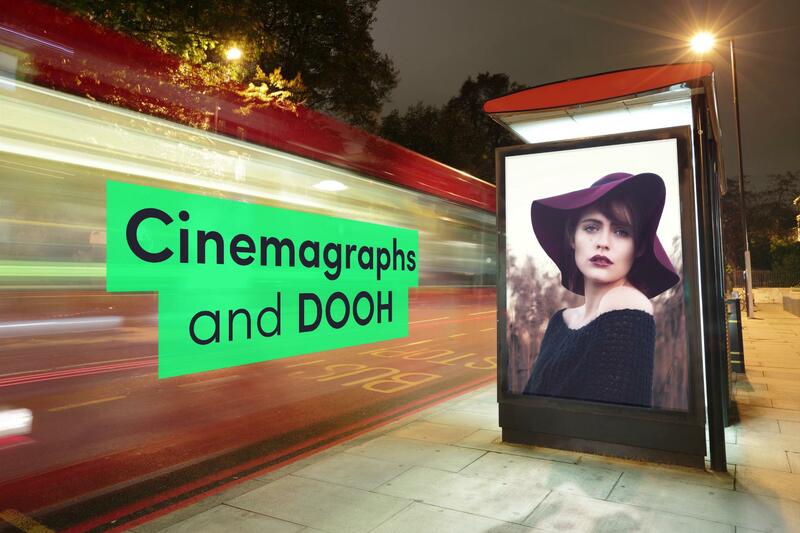 Nearby in Germany, there’s a similar strong demand for cinemagraphs in the DOOH marketplace. Jens Huber, a regional manager with German advertising firm Ströer, confirmed that his clients have been asking more and more about cinemagraphs. And he’s not surprised. “Cinemagraphs are a particularly effective tool for digital out-of-home campaigns because they combine sophisticated aesthetics with attention-grabbing movement,” he said. If there’s one lesson to take away from all of this, it’s that digital advertising is not only on the rise, it’s on the rise and paving the way for one of the most exciting artistic mediums of our time: cinemagraphs. The combination of the two will offer countless advertising opportunities for a wide range of markets — from food to tech to sports, and everything in between. The most important question then for marketers is not will I embrace this new development, but rather how will I embrace it? Don’t forget that cinemagraphs are also great tools for smaller scale projects like e-mail marketing campaigns. Find out more HERE. I’m Mason, resident copywriter and community manager at gallereplay. I love cinemagraphs because they make storytelling possible without language. When I’m not working, I enjoy cooking, making plans to read all the books I’ve bought, but never opened, and listening to Pod Save America.